You may have seen them on the Courtenay River, along the Estuary or in the Comox Marina—life jacket clad individuals and groups standing on surf boards with paddle in hand, propelling themselves across the water. You’d be forgiven if, like me, you mistook them for traditional fisher-folk performing their daily work. They are not fisher-folk, however. They are stand up paddle boarders—participants in the world’s fastest growing water sport. Originating in Hawaii, participants stand on a specially designed surf board and use a paddle—along with their core muscles—to propel themselves across the water. Barely 10 years old in its modern form, the sport has an enthusiastic fan base worldwide. 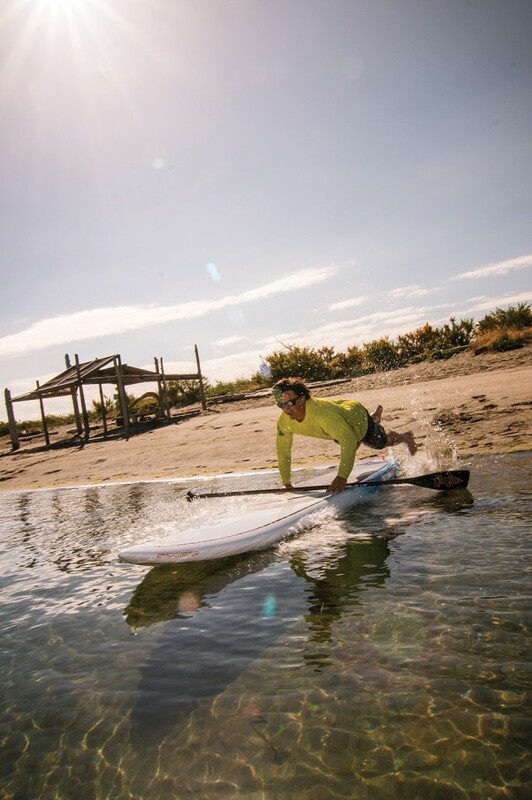 The appeal of the sport is in the ‘glide’—the moment when body, board and paddle work together to create the sensation of floating smoothly across water. And it has been in the Comox Valley pretty much since its inception. Local stand up paddle boarding starts with brothers Stuart and Andrew Robinson, water sport enthusiasts and co-owners and operators with their dad James of Compass Adventure, a water sport teaching centre operating out of the Comox Marina. For the past 25 years, the Robinsons have been teaching sailing to students and residents of the Comox Valley. In 2004, Stuart and Andrew tried stand up paddle boarding as an alternative to weather dependent water sports like wind surfing, and immediately saw the potential. To say the brothers hit the sport hard would be an understatement. Both Robinson and his brother compete in stand up paddle boarding, and have earned top place North American finishes in the past five years. Stuart is the 2013 national champion. In 2006, they started SurfSUP, their stand up paddle board company offering lessons alongside the Compass Adventure programming. The company name is derived from the old time saying “Surf’s up!”, meaning “Now is the time to hit the surf! The conditions are perfect. Let’s go!”, and SUP, the acronym used for stand up paddle boarding. In 2008, they launched the SurfSUP Island Series, a three-event race series intended to showcase the sport of stand up paddle boarding on Vancouver Island. Stand up paddle boarders of all ages and abilities compete in a combination of beach sprint races, fun relays and long distance courses in Victoria, Tofino and Comox. Spectators get to enjoy a beachside BBQ, music, and demos on new water sports products. Locals can check out this year’s event in Comox on August 9-10. Despite these sorts of initiatives and an unwavering enthusiasm for the sport, stand up paddle boarding—and water sports in general—remain one of the best kept non-secrets in the Comox Valley. And according to Robinson, it is great. “We’ve been lucky to travel around and see a lot of different water sports areas,” says Robinson. “This one of the best places anywhere to do water sports.” Perhaps even better than Hawaii. Yes, the water is colder, but the conditions are better and more varied. The bay is sheltered, with ideal sailing conditions. If there is the need or desire for rougher conditions, it’s simple enough to head around Goose Spit for stronger wind and more waves. In fact, Goose Spit on a windy day is perfect for stand up paddle board surfing, along with wind and kite surfing. The varied water conditions have also allowed Compass Adventure to develop a unique progression-based learning system for all of its water sports programs. Students of all ages learn by doing and skills are broken down into age-appropriate and experience-based steps. The result has been a great deal of success out of a very small teaching centre. Compass Adventure racing academies have produced national champions and North American top placings in Hobie Cat sailing (an Olympic-class sport) and stand up paddle boarding. For example, 12-year-old Valley resident Mia Wheatley-Maltois is the 2013 junior women’s national champion in stand up paddle boarding, and Liam Cursley is the second place junior men’s finisher. Andrew Robinson was a top-three North American finisher in Hobie sailing as youth. “The program works and a lot of people throughout North America take note of what is happening here,” says Robinson. That track record of success, though, has not yet made water sports a big part of the culture in the Comox Valley. One factor is, of course, the temperature of our local water; it’s cold, and it’s not a lot of fun being out on the water on a windy winter’s day if you’re not dressed for it. That’s something most Hawaiians don’t have to contend with. But for Robinson, it’s more fundamental than that. “The ocean is not a place a lot of people feel at home,” says Robinson. “We should be. You can learn a lot about yourself in that environment.” That includes important life lessons like working through fear. The Robinsons come up against people’s fear of the ocean a lot in their line of work, and it is something that impacts both children and adults. Even someone comfortable on a river or lake can balk at the thought of being out in deep ocean water. There is something about the cold and the depth that hits a primal nerve for many. So, we tend to avoid oceans and water sports saying they’re not for us. That’s why the Robinsons and Compass Adventure staff spend a lot of time teaching basic water safety, and how to respect the ocean environment. Staff are certified coaches or instructors who are competitively or recreationally active in the sports they teach, whether that’s sailing or stand up paddle boarding or another water sport. It keeps staff passionate and up-to-date in their sports. For others, it radically changes their perspective on their community. “When you take advantage of the opportunities water sports present, you’re seeing your community in a different light because you are literally seeing your community from a different angle,” explains Robinson. Paddle up the Courtenay River from the Marina or the Estuary, and you’ll experience the river shoreline in a way you can’t from the street or even access because of how the city has been built. Ocean adventures can take you to places you otherwise wouldn’t access because of their distance or remoteness, and can expand your sense of space and relationship to nature. That sort of transformation is important to Robinson, who notes that people comfortable and confident in a water environment tend to become stewards of that environment. And that sort of care and consideration is something any community with a water sports area needs. “We are proud of what this community has to offer and we want to share that with more people,” says Robinson. To that end, Compass Adventure has partnered with the Comox Downtown Business Improvement Association “Comox by the Sea” to offer a weekly Tuesday evening paddle and BBQ at Marina Park. The event is open to the community and anyone with a paddle craft—whether that be a kayak, canoe, stand up paddle board, rowboat or something else. Paddlers can participate in a timed paddle on the water; it’s up to you whether you want to make it a race or a friendly paddle with your neighbors. In its first month the event attracted more than 40 people each week and Robinson hopes to break the 100-person mark by the end of summer. More than anything, though, Robinson hopes the event will help change people’s concept about the accessibility of water sports.